Digital sources: Wavelength Audio Cosecant USB DAC v3 (Transcendental 16/44.1 DAC module) fed by iBook G4 with dual 500GB LaCie Firewire drives; Tube Research Labs fully modified Sony SCD-2000ES (for SACD playback). Secondary: TRL-modified Alesis ML-9600 high-resolution master disk recorder. Preamps: deHavilland UltraVerve; modified/upgraded Eastern Electric Minimax (larger PS, 12FQ7 ready, gain cut to 9dB); Herron Audio VTPH-1MC and Monolithic Sound PS-1/HC-1 phono stages. Amplifiers: Wright Sound Company WPA 3.5 mono block and AudioSector AMP-1 integrated amplifiers. Secondary: Outlaw Audio RetroReceiver. Speakers: DIY Altec 604 MLTL. Secondary: Zu Audio Druid Mk.4; Sound Dynamics RTS-3; REL Strata III. Cables: DIY WM-XTC; Audience Au24 and Zu Audio Libtec cables; Audience Au24, Audience Maestro [on loan] and TG Audio Lab custom copper interconnects. Secondary: Analysis Plus cables and interconnects. 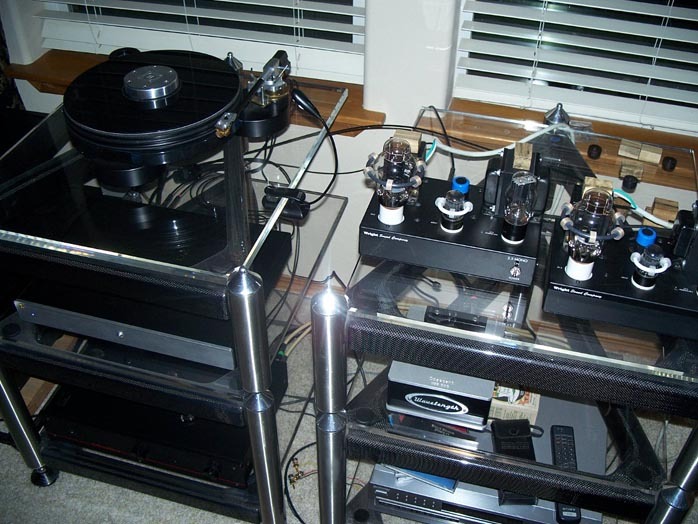 Sundry accessories: HAL-O® Vacuum Tube Dampers, Herbie's Way Excellent Turntable Mat, VPI 16.5 record cleaner, Shun Mook Valve Resonators, Auric Illuminator, and Walker Audio Vivid CD & DVD Enhancer. Office system: Soundquest R601 Tube Hi-Fi FM/AM Classic Radio and a Gibson J-100 acoustic guitar. Room size & treatments: 26' x 19' x 9' (a fractured 'L', nominally 16' x 19' with 12' feet of the 19-foot dimension opening to the 20-foot section of the 20' x 12' kitchen/eat-in area); concrete slab, sheetrock walls. ASC Tube Traps and Sound Planks, Echo Busters absorbers, Shakti Hallograph Soundfield Optimizers and Acoustic Revive RR-77 Ultra Low-Frequency Pulse Generator. In May of 2006, I awarded a Blue Moon to the Art Audio Vinyl Reference. The review concluded with the words, "I want one." At the time, the purchase was difficult to rationalize but regret set in rather quickly. I spent the next two years kicking myself for sending it off to another reviewer at TAS instead of buying it on the spot and telling TAS to arrange for another unit. That's how these things go. Dammit! Since then, aside from my time with a subsequently reviewed Audio Horizons piece, I've been largely content with the Monolithic Sound PS-1/HC-1. It's something I kept after a survey of budget phono stages in 2001. While it is not perfect, I do love the suave and subtly hued presentation it delivers. Though it's not a dynamic dynamo, it respects meter. Over the years I've resisted numerous offers to sell it because it is very musical. When one considers the combination's $658 price tag at the time of purchase, one might call it a steal. The Reviewer: Why bother? Does it have a prayer of pleasing these ears, spoiled as they are from listening to units costing 5 to 10+ times its meager price? I really don't think so. The Languid Man: What-ev-er. I just don't want to have to commit to penning the review. Can I listen to some music, now? Please? Before Hobbyist could even get his credit card out his wallet, Joy Seeker was dialing 1-770-667-5633. 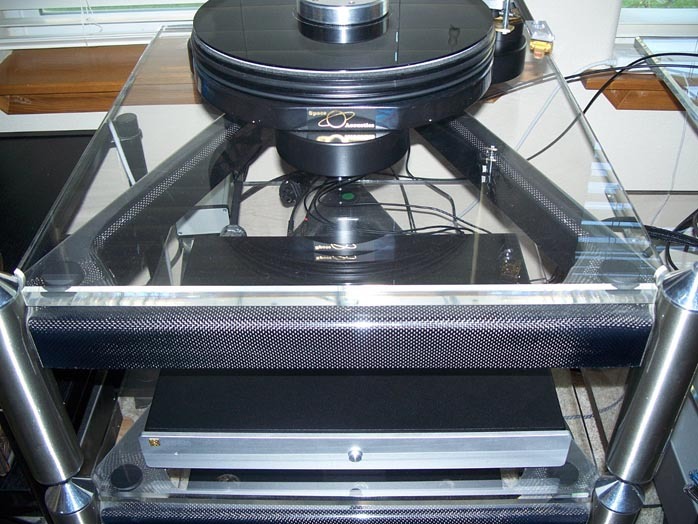 Thankfully, Walter Liederman of Underwood Hi Fi took the call and Languid Man put our money where Reviewer's doubts were. After all, no loan requested, no review required. Two weeks later, it was time to color Reviewer all wrong. With that accomplished, you might as well have added some insult to the very congenial injury. After all, we came very late to this party. If memory serves correctly, the JD-9 was introduced at CES in January of 2005. Yes, Reviewer was there, but Joy Seeker must have thought it was a vacation. We collectively missed the unveiling, probably due to a boisterous night out on The Strip with the boys. Anyway, since being introduced, the little JoLida has been a very popular item, no thanks to us. In fact, as far as we know -- for all the hype from owners who post with blissful abandon over the worldwide web -- there's been only one formal review of the device (see PFO, Fall of 2006). JoLida is a privately held company that was incorporated in the state of Maryland in 1983. Until 1995, their primary line of business was the fabrication of vacuum tubes, cavities and assorted electronic parts. In 1995, JoLida launched a line of integrated stereo tube amplifiers in the US market. Rated sensitivity at 0.25mV - 95dB. Two Outputs: Low gain, high gain. You read it right. How's that for a sweet sliding scale? After burning it in for a week with the Hagerman Technology FryBaby, we invited our speaker-building partner in crime, Pete, over for the first listen to this unmodified, über-flexible overachiever. All of us spent several hours grinning from ear to ear. Was it perfect? No. Remarkable? Yes and no. Better than anyone has a reasonable right to expect for $450? For certain. The sound was life size, the presentation spacious and the pace admirable. The tone you ask? Convincing. Especially on guitar, vocals and cello. Unheard of in our experience at this price and more significantly, far beyond.